Last week, I shared five ways you can celebrate Valentine's Day ethically, and that included my recommendation to look for sustainable jewelry options. As promised, I've put together my favorite pieces from brands who are providing ethical options for those who want to sport some bling that is kind to the earth and the people on it. Regardless of whether you're making a jewelry purchase now or years from now, one of the best things you can do at the store is ask whether the line you're looking at is part of the No Dirty Gold campaign, where the jewelry is made, and if there are any vintage pieces you can see. 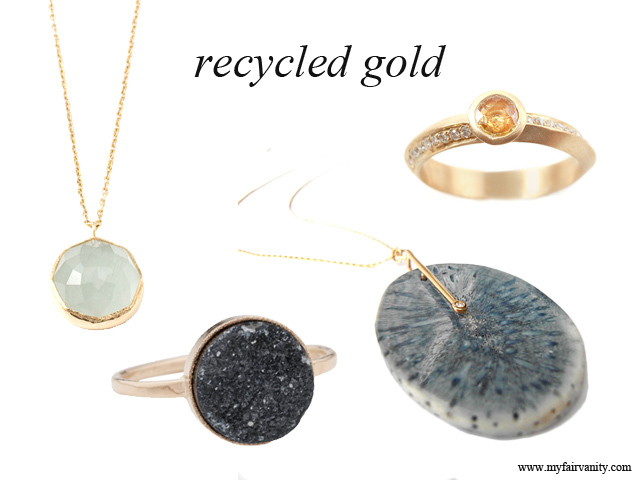 All three of these Etsy shops use only recycled gold and ethically sourced jewels in their affordable, beautiful pieces. There are many more like this available if you simply search for "recycled gold," but Michelle Lenae is my favorite of the three. This company made my wedding ring (seen up close here in this post from last winter) using recycled platinum and conflict-free diamonds from Canada. Their tasteful rings start at $495 but move all the way up through the $20,000 price point. They also have a collection of antique rings you can shop. Alberto's jewelry contains only reclaimed (recycled) gold - gold from the existing supply chain that is recycled and refined. By choosing to use reclaimed gold, Alberto does not contribute to the environmental destruction, waste, and social injustice caused by metal mining. Alberto's jewelry is handcrafted and manufactured in the United States using conflict-free diamonds and fair-trade gems and he is a member of the No Dirty Gold campaign. Using only recycled gold, Monique Péan is committed to fair trade labor and giving back to the communities she works with in her supply chain (learn more here). Bonus: her jewelry is stunning, on-trend, and so so cool. Why? 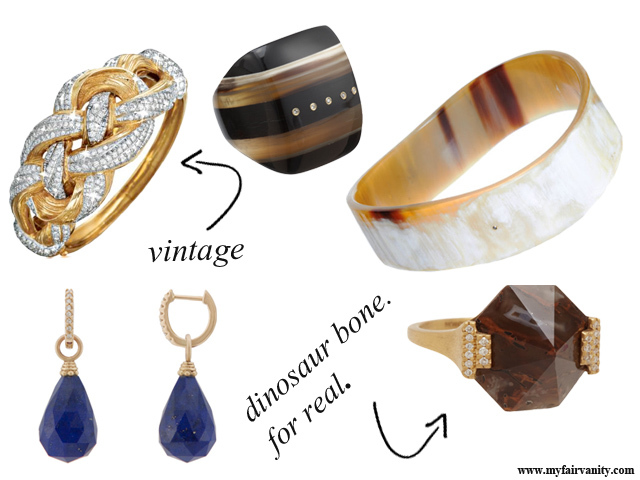 SHe incorporates dinosaur and woolly mammoth bones in her jewelry! I would never, ever get tired of explaining my dinosaur ring to anyone who would listen. Oh this old thing? No really, it's like, super old. IT'S MADE OF DINOSAUR. Shop her Barneys collection HERE. Shop their luxe vintage collection, all of which was made in the USA. I wouldn't mind wearing that cuff on the top left to the theatahhhh, amiright?